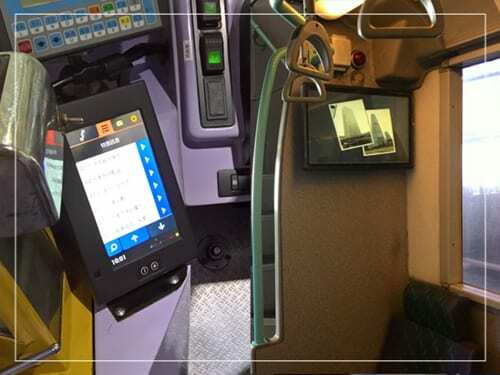 For the event, NEC Hong Kong, faytech North America created a waterproof and rugged 7” resistive touch screen display solution to be used in buses worldwide. We added polarity protection, and with the goal of streamlining installations for long term operations, faytech NA also provided overvoltage protection solutions. This ensured that the units are capable of surviving the most extreme load dump tests. The units passed successfully at as much as 174V @ 1Ohm for 350ms. The unique stable stand combined with easy operation functionality includes brightness auto-sensing and brightness buttons. This makes faytech NA’s 7” touchscreen monitor one of the best choices for any bus. Our 21.5” touch screen monitor with a glass protected front plus rubber casing results in a perfectly safe choice for buses and managing customer information.